This new update to iBird Photo Sleuth now includes access to our ornithology experts who will help identify your bird if you want more help. The “Help Me Identify a Bird” forum has been around for 10 years and has over 100,000 members. Every now and then an app breaks out from the pack with features that are simply astonishing. 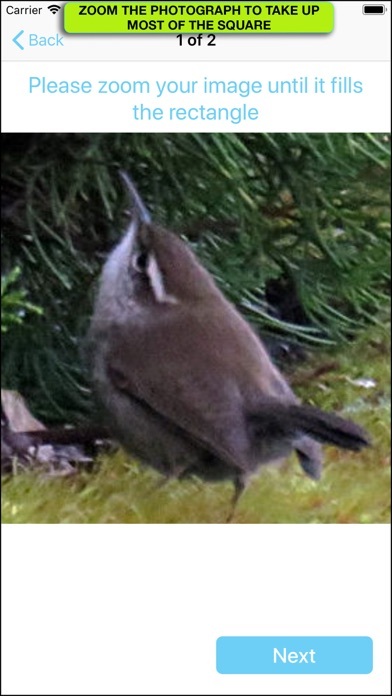 iBird Photo Sleuth fits that mold; use its machine learning "brain" to identify a photograph of any bird of North America, regardless of the photo’s quality. Photo Sleuth uses Apple’s new CoreML machine learning system to figure out the species in even the most distorted, fuzzy and poor contrast photograph. 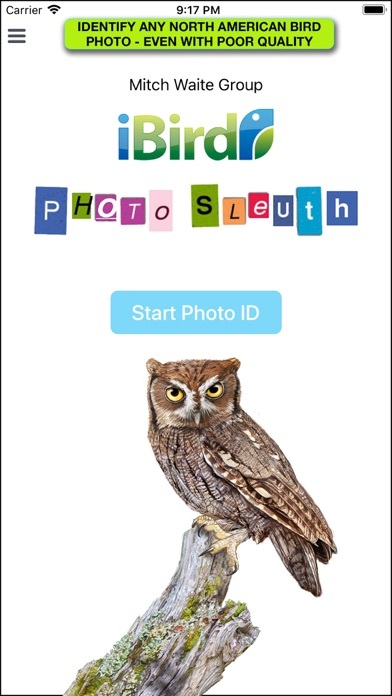 The Photo Sleuth app has been “trained” by over 2 million photos of bird species to ID birds with uncanny accuracy. You can use iBird Photo Sleuth in the field -- no internet connection is required, because its CoreML database is contained in the app. Take a photo with your camera or select it from the built-in iPhone Photos gallery (Dropbox, Google Photos and OneDrive coming). 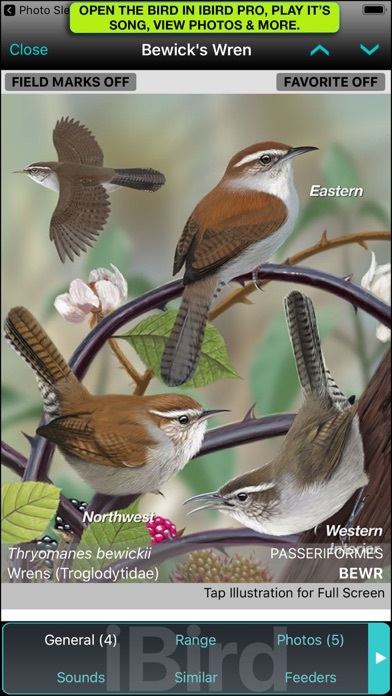 Don’t worry if the bird is a tiny blob in the frame; Photo Sleuth is smart enough to find the features that distinguish it from all other 900+ bird species of North America. 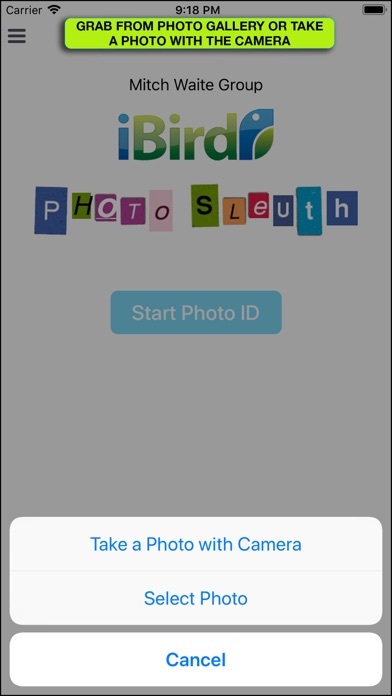 After you submit your photo to the Sleuth, it will give you a list of its top 3 guesses as thumbnail sized images. Each will display a “Confidence” value between 0% and 100%. When the Sleuth is really sure of its analysis, it will produce a high value; when unsure it will display a low value. If the app thinks that you have submitted a photo of something other than a bird, it will display “Not a Bird.” Of course, some people’s faces look like birds, so it may still suggest a bird species. For example, my selfie came up with “Not a Bird” for the #1 spot and the Barn Owl for #2. 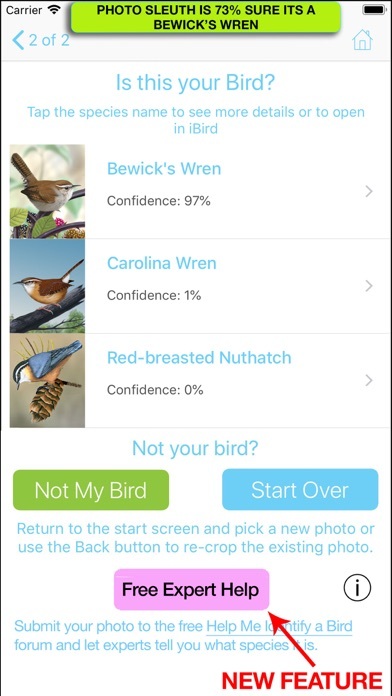 To help confirm the 3 guesses made by Photo Sleuth, you can tap on any of the thumbnail images to open more species details, including an enlarged illustration, text that explains important field marks and a range map that shows the migration coverage of the bird. 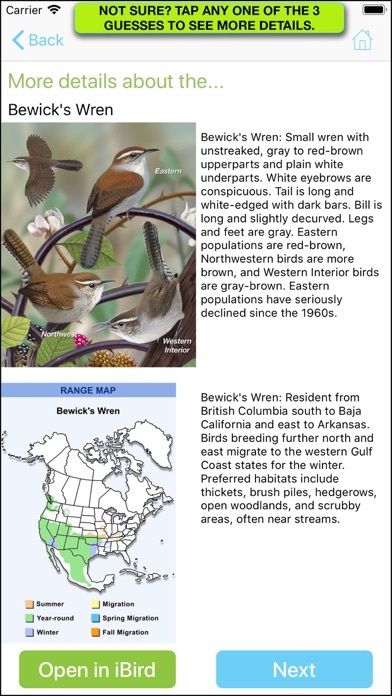 The range map includes a range and habitat paragraph that helps confirm that the species is indeed located in your GPS area. A future update will add our “Birds Around Me” technology to further narrow the choices that Photo Sleuth guesses. On this same screen you may open a rich content species account in our iBird app (should you have it on your phone) to review much more information, including playing the bird’s songs and calls, seeing similar birds, behavior details and much more. 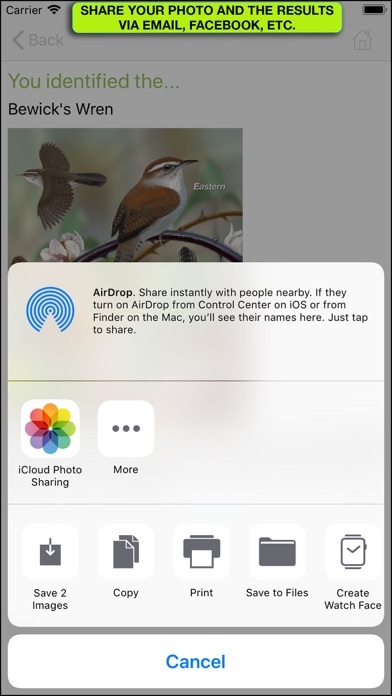 Sharing of your results can be done two ways: you can share your photo and the Photo Sleuth guesses with your friends via Apple Messages, Email, Facebook, Twitter and all other functions such as printing, which appear on the standard Apple activity menu. There is also a button for optionally sharing your photo and the results of the Photo Sleuth guess with Mitch Waite Group, so that we can improve our neural network. Both correct and incorrect guesses help us improve the performance of the artificial intelligence. Or course, we only use the photograph for training, and the copyright remains with you. 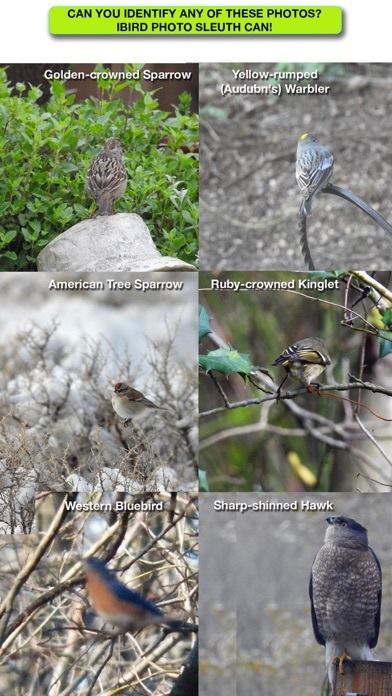 If you would like more information about using iBird Photo Sleuth please visit: http://ibird.com/sleuth/sleuth.html Be sure and check out our new bundle The Delighted Birder; which includes this app plus iBird Pro and iBird Hawaii-Palau. A friend recommended this app. All I can say is it is very accurate. 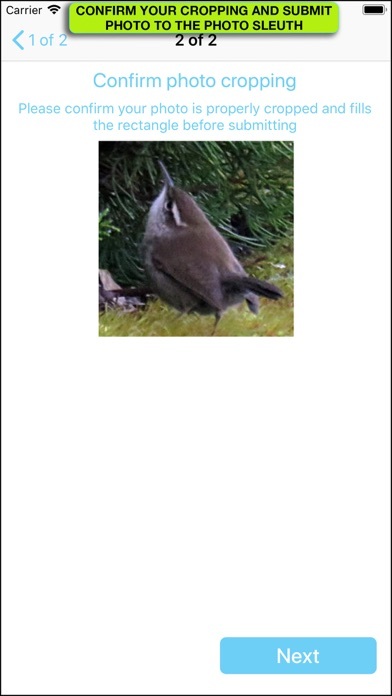 Even when I can’t get close to the bird, and have to zoom and crop the pic, so far this app has never missed. I’m very impressed. Thank you for adding the Mexican owls, please I have birds endemic to Baja. Not happy with buying the sleuth application and then having to buy it again as in App plug-in. This iBird app works very well. Even with some far away bird shots, it can help a lot in identifying birds I have photographed. It’s a good, quick way to verify what I am thinking a bird is. Some identification is obviously well off but those are usually for good reason (poor quality photo or odd angle) but by in large it works great. When I find a photo on my computer that is unusual and unnamed, I take a photo of that photo with my phone, go to this app, and get an immediate id. So helpful! This app has a fantastic identification rate. Have only used a few times so far, but have been fairly impressed with the results. Fuzzy bird photos do not seem to work. Also to use a photo made with the iPhone, one would need really close to the bird in order to have enough detail to ID the bird. Works great. Indispensable for the less experienced.